The University of Nebraska–Lincoln College of Business Information Technology Services employs high school interns during the summer in conjunction with the Lincoln Human Resource Management Association’s 1st Job Lincoln program which connects students and employers. To make the connections work for the college, Ty Biggerstaff, supervisor of ITS Technical Solutions Center, spends time mentoring students. In the spring, Biggerstaff attended an event called ACE IT which was conducted by 1st Job Lincoln. He provided tips for high school students to assist them in pursuit of employment. Although Biggerstaff wants students to have fun, he also addressed the importance of a student’s first job. Students from Lincoln Public School Career Academy turned out to receive job preparation tips. “Even though they’re in high school and it’s summer, this isn’t a break. It’s a job. They’re stepping out to go above and beyond what they’ve done before, so they should take it seriously, and look at it as the beginning of a career. At the College of Business, we have high school interns perform the same tasks as our current technicians,” he said. 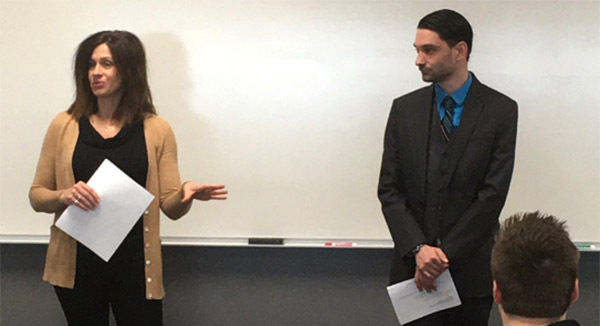 The College of Business hosted the 1st Job Lincoln student intern recognition day last summer, and as host employer, Biggerstaff was invited to the ACE IT day. He used the opportunity to make connections for hiring interns this summer. “The students in the 1st Job Lincoln program come from the Lincoln Public School Career Academy. They are highly educated when it comes to technology. Getting a 17-year-old who knows more about technology than a lot of college students is amazing to me. We’re fortunate to have this program in Lincoln because there’s not a lot of programs helping teenagers transition into adulthood,” he said. After the program, Biggerstaff stayed and helped answer questions individually with the students. He said the hottest topic of conversation was the new College of Business building. Although this summer’s interns will not get to work in the new building, he believes the new facility will be a big selling point with interns going forward. Biggerstaff recently announced Kyle Krueger and Holden Pulver as the 1st Job Lincoln interns for the summer of 2017. Both students attend Lincoln Southeast High School.